Play Free Games at Roxy Palace for Real Cash! Anyone who has ever entered a casino, land-based or online, has dreamt of winning a large sum of money and walking away with a smile. However, not everyone wants to enter a brand new virtual establishment and lay their money on the line, and that's why the free games at Roxy Palace are available to you with no download and no payment required. The offers are incredibly easy to claim, and it is even possible to win some real cold, hard cash in the process! There are a few limitations, of course, so anyone who is considering these incentives should fully understand the terms and conditions prior to accepting them. Roxy Palace Casino was established back in 2002. It is licensed and regulated in the jurisdiction of Malta, and it is powered by software that is provided by Microgaming, the world's largest and most renowned developer. As such, the venue boasts more than 500 unique titles including more than 200 slots, over a dozen variations of blackjack, all of the most popular roulette wheels, craps, baccarat, video poker, and so much more. The graphics are of superior quality as always, and the sound effects add yet another layer of realism to the action. They make these titles available to individuals in either a downloadable or instant-play platform, though people who are going to spend a lot of time gaming are encouraged to install the suite since the graphics are much better, there are more games included, and there are more individual settings that users can customize to their liking. Participating in free games at Roxy Palace isn't a difficult endeavor and there are several different ways in which it can be done. First, individuals who aren't interested in winning cash prizes can simply use play money to make their wagers, though this isn't available with all of the various offerings. Secondly, users can get a no deposit free spins bonus that can be used to try out many of the slots that are on offer - and they'll get to keep their winnings once they have met any play-through requirements associated with the withdrawal. Finally, users can opt for a more valuable deposit match, but the maximum values available will usually require a significant payment of more than $100. For instance, at the time of writing, the offer stood at $1,250 spread out over the course of the customer's first four payments. With a 100% match for the first, a 25% match for the second, 30% for the third and 25% for the fourth. 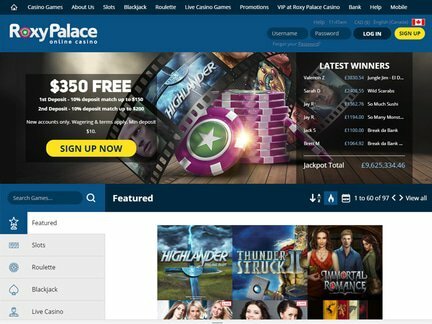 It is evident that there are several different ways to enjoy free games at Roxy Palace, but it is important to understand that these cash offers do have some terms associated with them. Individuals are often required to wager as much as 40 times the amount of money they received before any of the winnings they earn with it can be withdrawn from their accounts. Of course, with proper money management, this can turn out to be a minimal investment on the customer's part.